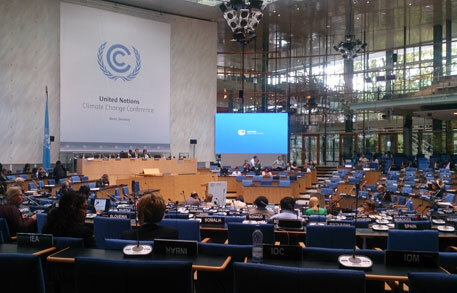 The preparations and final negotiations on the draft text that would form the basis of the new climate deal to be signed in Paris next year began in Bonn on Monday. It is the sixth installment of the second session of the Ad Hoc Working Group on the Durban Platform for Enhanced Action (ADP); the session will conclude on Saturday. The general atmosphere of the session was that there was a positive momentum that needs to be carried forward from the UN Summit in New York where people’s mobilisation showed that climate change is an important issue and needs to be addressed in an equitable and globally responsible way. Agreement is still needed on the issue of Intended Nationally Determined Contributions (INDCs) on what would be the contributions for each country and how it would be determined. These decisions have to be formalised in Lima since countries have to provide this information early next year. The coming week would hold two of the remaining technical expert meetings (TEM) on Tuesday and Wednesday on carbon capture, use and storage and non-CO2 greenhouse gases. The technical experts were requested by nations to share policies, practices and technologies and address the necessary finance, technology and capacity building, with a special focus on actions with high mitigation potential. By facilitating interactions between the governments, experts and other stakeholders in the implementation of government policies, they will carry the drive for climate action forward. Since March 2014, TEMs have been conducted on topics of renewable energy, energy efficiency, land use and urban environment.